The Winter Solstice arrived well before sunrise yesterday morning but "winter weather" actually arrived last week when a cold storm blew snow onto lower elevations in the Southwest that had not seen that much in nearly thirty years. On December 18th, Las Vegas got 3.8 inches of snow and the I-5, I-15, and CA Highways 14 and 38 were closed when the Cajon and Tejon Passes were covered in snow. 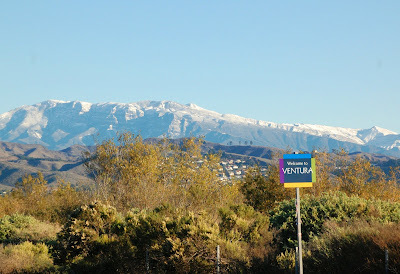 Even the Santa Monica Mountains in Malibu got a little bit of the white stuff. It was amazingly spectacular but according to the record keepers (of whom I am one) almost twice as much fell in December of 1979. I woke up to a soft rain this morning and am thankful it was clear and dry over the weekend. I got about a third of my spring bulbs planted between recovering from my cold and preparing for our Choir Christmas Concert. 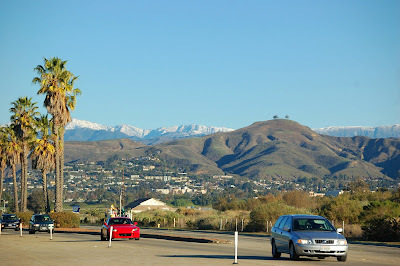 These are a few shots of our local mountains after last week's storm cleared. 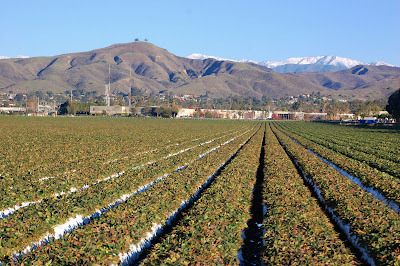 Click on this photo and look closely; you'll see some of the strawberries that survived the rain and cold and are ready to be harvested.